Hello everyone, welcome. 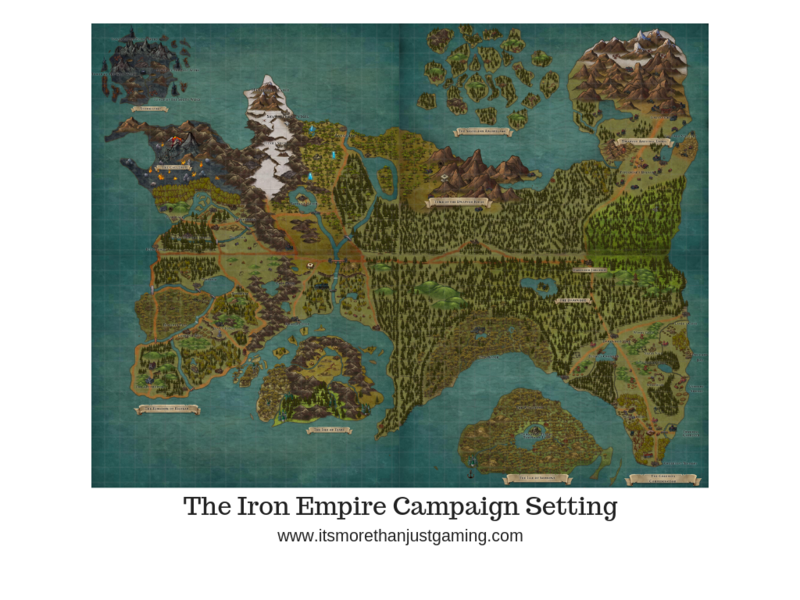 I recently started running my first ever DnD campaign based on a homebrew setting, the Iron Empire Campaign Setting, and I thought I would share the details of the first few sessions here to see if folks were interested in the exploits of my friends playing DnD in my living room. The first session was necessarily a bit bitty as the players didn’t start as a pre-made group as I didn’t think that made sense for a campaign, part of the story should be them forging a bond. This game uses Dungeons and Dragons 5th Edition rules. Kah’rinas is a 15 year old Triton who is a knight of the order of Sashelas, and for the last 10 years he has received visions from Sashelas of the fiery destruction of three nearby villages, Shoreth, Covin and Vilmer. In his dreams he sees three eyes in the night raining fire down on these aquatic villages destroying them. Two eyes are close together, and a third is slightly more distant. One of the pair, the one between the second member of the pair and the distant one is slightly red. The villages were indeed destroyed years before and the game started with Kah’rinas waking in the temple in the Village of Eeselet (named Eeselet because I forgot to name it and there was a tube of cheeselets behind me and Stuart could only see the letters Eeselet). This night’s dream was different and showed the same fiery destruction of the village of Lumen Reef. So, like a dutiful cleric and knight, Kah’rinas sought out his Abbot , Maglas Nunalvan, who sent him to investigate. As Lumen Reef was quite distant Maglas summoned an Orca to speed the transport. Upon arrival, Kahrinas discovered Lumen Reeef had indeed been destroyed, though only recently. The village was more or less razed to the seabed (Tritons are a seaborn race if it was unclear) and there were a few scorched corpses (yes, scorched under water). Kah’rinas found the local member of his Order, an Older Knight by the name of Terim. Or, more accurately, he found his body. He too had been scorched to death and it looked like the source was something that had impacted his chest. Further investigation was prevented by the Intervention of a Shark. Kah’rinas managed to drive off the shark, wounding it sufficiently that other aquatic predators attacked it rather than him. This gave him the opportunity to notice three lights in the dark that made him think of the eyes. He swam closer and discovered them to be angler fish. They swam towards the surface. Taking this as an omen, Kah’Rinas followed them and saw on the surface a boat. There were dark shapes circling the boat attacking it, arrows being fired into the water by crew or passengers. Sealgair started the game on assignment. His mentor, a Goliath Ranger called Kuloth Skywatcher, had sent him to the Halfling Greensea Confederation to a town called Shady Vale to help the local constable, Gwendolyn Stoutheart. The town of Shady Vale had lost some livestock, presumably to some animal attacks and they wanted some expert help and Kuloth thought it would be a good learning experience. Sealgair arrived in Shady Vale, a halfling farming town, to find it reasonably peaceable. Most folks carried on their business with nothing noteworthy about them. A few halflings walked the perimeter of the village, red armbands on their arms. When asked, these deputies were able to direct Sealgair to the constable’s hut. Gwendolyn was a friendly, professional halfling whose expertise was not in the wilderness, despite being in a farming community (or perhaps they were just throwing this rookie ranger a bone to get some experience???). She outlined that Graham Fardale was the shepherd who had lost the most animals, though Harry Tallyarn had also suffered some losses and had some “crackpot” theories. Fardale could be found on the nearby hillside most likely at his hut, Tallyarn was in the tavern. Ignoring the obvious plot hook, Sealgair decided to go straight for the hills – After all, he was a Ranger. What could go wrong? As it was his first game I decided to let him roll for a survival check as his first ever dice roll. Do you know what the odds of getting a botch at something you are good at are, on your very first dice roll ever in a DnD game? Me neither but that is what happened, and as a result two things occurreed. Sealgair became lost and had to be found by Halfling Deputies and pointed towards the Shepherd’s hut (imagine Aragorn being guided by Merry and Pippin), and the locals renamed the hills. Actually, the locals didn’t rename the hills. That was just me having a laugh and I haven’t changed the map back. One of the players did another artist’s impression of events. Damakos was currently engaged in thieving activities, in the distant Kingdom of Kyltear – a human nation. He was hired by a gnomish crimeboss, Tovish Underhand, to break into the estate of Julian Goldsmith. Goldsmith’s business ledger was of interest to Underhand, and so he supplied plans to the Goldsmith estate on the agreement Damakos steal him the Ledger from the Goldsmith Safe, and any money that he finds he can keep. Damakos started his adventure already in the walled grounds of the Goldsmith estate, hiding in some trees (It is a walled estate with a lot of land, including its on little forest). The treeline ended 30 foot from the main house where a human only party was happening. The grounds were being patrolled by security guards, none of whom were observant enough to spot Damakos nipping from tree to wall and clambering up to a balcony. He quietly opened the balcony door, and then was presented with a darkened room. He heard noises from within the room which presented an obstacle for him (Tieflings have darkvision so he could see exactly what was happening…). Someone was in there, and he needed to be careful to not be discovered. Fortunately they were otherwise engaged. Stuart was spending his downtime using my drywip board sketching the various scenes and taking photos.. I like to think that since Damakos saw the whole thing through Darkvision, which is in Black & White, it was slightly classier than simply a Tiefling stumbling on some drunken party guests doing…well, you can figure it out. Like a good little thief, he pinched the lot and scarpered. He got out of the house, through the woods and out through the drainage pipe where he had gained access hiding his loot along the way only to be confronted by a gang of armed men on the other side of the pipe. He was knocked out. Dova’s adventure starts face down in the dirt of his homeland, Stormvault. He was in the middle of being judged by the priests of his people, the Stormcallers. Stormvault had recently come under attack by a large mercenary army, and Dova had wanted to do his part, murdering as many as he could. Unfortunately the priesthood, the Stormcallers, hadn’t called him to serve and neither had his draconic nature awakened the sorcery in his blood. So Dova had sought whatever power he could find to fight the invaders, and his seeking was answered by Sarastra, Queen of Night and Magic: an Archfey. Dova’s newfound abilities proved more than capable of assisting destroying the invaders, however when it was discovered that he had taken the gifts of the Archfey, the Stormcallers had been furious and brought him to one of the craters in the blasted lands of Stormvault for judgement. The High Stormcaller, Svaroc, was in the process of rebuking Dova for his impertinence and his unclean magic when a swarm of lightning bugs in the shape of a female form appeared beside Dova and ordered him out of the Dirt. What then followed was an argument between Dova and two very powerful beings, his fate hanging in the balance. The swarm was, of course, a manifestation of Sarastra – the Archfey closest in ideology to the Dragonborn of Stormvault (The God of the Tempest and Magic was a Blue Dragon before his ascension, and Stormvault is a Blue Dragon Boneyard). Dova was able to win a smidgen of respect from Svaroc by refusing to show fear, and to challenge even the 13 Stormcallers, and this along with the arguments of Sarastra, commuted his sentence of death to a sentence of Exile. The Stormcallers roared into the crater, roaring a Dimensional door into existence. A Doorway that was then corrupted by Sarastra and instead of dumping him in a place called “The Cauldron”, he landed in the Halfling Greensea Confederation. Waiting for him was an aging Tiefling in Monastic robes standing next to a Horsedrawn Carriage. The Tiefling addressed Dova by name, and told him he had been waiting for him and invited him into the carriage. As this was Ryan’s first game, this was his first opportunity as a player to blatantly ignore where the Dungeon Master wanted him to go, and he did that by ignoring the Tiefling and walking in the opposite direction. He told me it was because he had the personality trait “I don’t trust easily” so I gave him inspiration for it. Mungo started his game in the Temple of the Valiant Heart, the place his parents (both Monks) left him when they were called away years ago to perform some service for some unnamed friend. As he was sparring he became distracted in the training yard, seeing the translucent form of a Golden Winged Dragonborn in robes in the darkened hallway leading into the sparring room. His partner thumped him pretty good, knocking him out cold as a result of the distraction and when he woke up he was in a Halfling Village. The village was on fire and there were three eyes in the night above raining fire down upon it. Being a brave soul, Mungo ventured through the burning village trying to help the folks there, and whilst he was doing that he heard the unmistakable sound of the movement of armoured individuals. He moved closer to get a better look and saw a number of said Armoured Warriors. They were taller than halflings, maybe elf or human sized. The armour was orange metal and quite close fitting though it didn’t seem to impair movement at all. Their faces were concealed by white conical helmets that curved back somewhat. Each warrior held a sword in one hand and kept the other free. Mungo could see some of them hurling fire from their empty hands torching the village. Before he could see more, he felt a hand on his shoulder and he turned to see the Golden Dragonborn behind him, the 3 eyes behind the Dragonborn. The Dragonborn simply said to him, “Find your father, brave one” and then he woke up. As he drifted from sleep to wakefulness he got a good look at the eyes. Two were spaced close together as in a face and one was further away from the other two. The one in the middle was slightly redder than the others, and as he tried to focus on them he realised he was staring into three wall sconces in the Monastery Infirmary. He was alone but he could hear shouting, and crashing. The room was warm and he could smell burning. The Abbot, Gerald Stonefist, arrived in the Infirmary and told Mungo that he would need to gather his things quickly and go. The Monastery was under attack, and whilst the attackers didn’t realise it yet, they were looking for Mungo. Mungo told Gerald about his vision, who simply nodded and told him that his Father was in a town called Grassmere and that he would send as many acolytes as could be spared with him to find him. Mungo and 4 acolytes left the monastery with heavy hearts, their home burning down and their friends fighting for their lives against some unknown assailants, but they had a mission and they wouldn’t fail. This was only half of our first session however I will continue it in a separate post as I have breached 2000 words and that is quite long enough for a blog post I feel. You can read part 2 of this chapter by clicking this hyperlink.